Sometimes it all comes down to what’s on the packaging. In this case, excellent vertical and horizontal merchandising light levels (180 FC average) were provided to help display product and make labels easier to read. 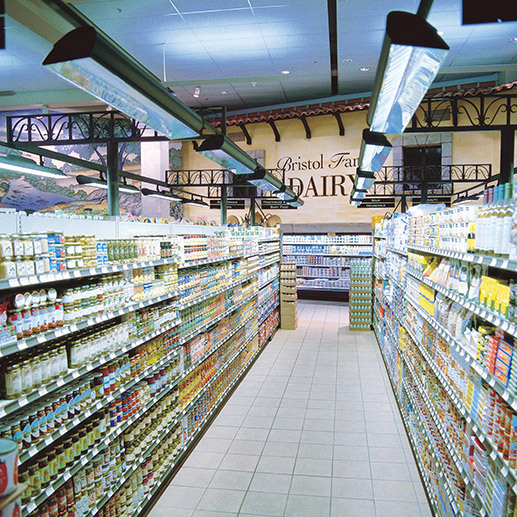 Bristol Farms store designers chose to attach the fixtures to a decorative structure secured to the islands. For the comfort of shoppers, louvers provide lamp shielding on these SY Series fixtures. The ratio between the illumination on the merchandise and light levels for customer evaluation is well within the 3 to 1 ratio recommendation of the IES.